This week, the Year 9 students at Northside Christian College took part in their first of four challenges for the year with their Coastal Challenge in Angelsea. 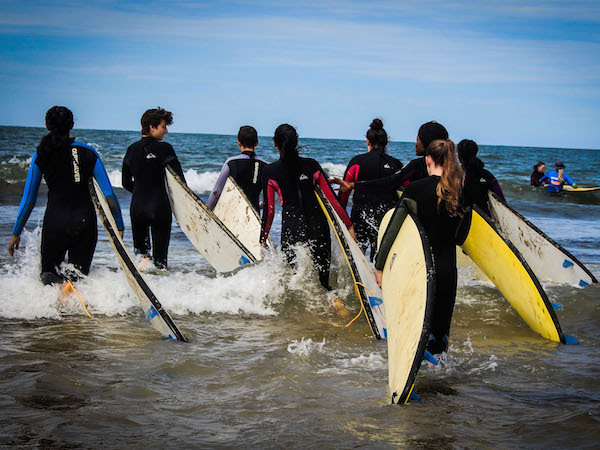 The Surf Challenge Camp provided an opportunity for students to complete a variety of challenges and activities. Students surfed, paddle boarded, spent time journaling and time in quiet reflection with God during the two day camp. The camp also provided an opportunity for students to collaborate and to strengthen their friendships at the commencement of this important year. Learning to pitch in, sharing tasks, helping out, putting up tents and sharing close quarters with classmates were just some of the other challenges encountered. It was also an opportunity for students to shine, which from all the reports from camp, the Year 9’s as a class and a number of individuals, most certainly did. It is hoped that during the Year of Challenge that each young person will achieve personal growth academically, socially, physically and spiritually as they learn to lean on God, work with and rely on others, set for themselves goals and in some cases, challenge and face their fears. Ms Jo Westland, Director of Learning – Middle School, acknowledged and thanked Mrs Anna Venegas and Mrs Lyn Fishwick for all their hard work and planning along with Mr Phil Waters, Ms Olesya Eichwald and Ms Teresa Connelly for giving up their time to make this camp possible.